Statesmen, Representatives, politicians, and sheriffs from around the country, from states such as AZ, MT, WY, Washington state and more, and one lone Nevada Assembly woman, Michelle Fiore, are gathered at the Bundy Ranch and are requesting the Bundy family allow them to sit in vigil with the family, in their home, due to intel that federal officials are planning some type of raid against the Bundy family after the Bureau of Land Management apeared to back off, ceasing operations against the family and releasing the cattle they stole from them. 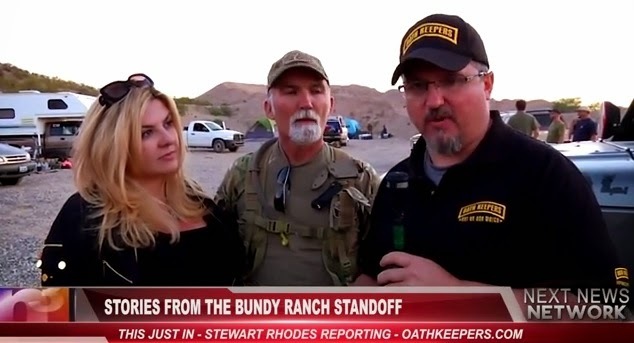 What these elected officials, politicians and sheriffs are attempting to do, ‘so the government knows if they are going to do a raid on the Bundys,’ they want them to know that there are elected folks, sheriff and representatives, who are there in the home, standing with the Bundys’, according to Stewart Rhodes from OathKeepers, shown in the video below with Assembly woman Fiore. Any raid on the Bundy Ranch with the armed security there, surrounding the Bundy family as protection, is guaranteed to be violent and would now include the possible injury or death of these elected officials and statesmen who are willing to put their lives on the line to protect the Bundy family. Kudos to all that are stepping up to stand with the Bundys’.